The now increasingly ubiquitous air-conditioner (AC) in our houses would easily make it to the list of the top environmental criminals. Why? Just consider these facts. In Delhi, a mere 1°C drop in temperature leads to a 400 MW drop in demand for electricity. This is because ACs account for some 30 per cent of Delhi’s electricity demand and over 60 per cent of its peak demand, according to the data of the Bureau of Energy Efficiency (BEE). In fact, the peak demand hour for electricity is changing. Now instead of evening—traditionally this is when people reach home and switch on lights—it is late afternoon. This is when the household and commercial electricity-usage hour is coinciding. So it is ACs that determine electricity demand and will determine energy efficiency and security. So how efficient are the ACs sold in India? More importantly, if they are rated to be energy-efficient do they perform as efficiently? My colleagues at the Centre for Science and Environment (CSE) decided to find out by getting branded ACs rated five-star by BEE tested for performance. The tests reveal that there was a dip of 2.5 per cent in energy efficiency for every degree rise in temperature. 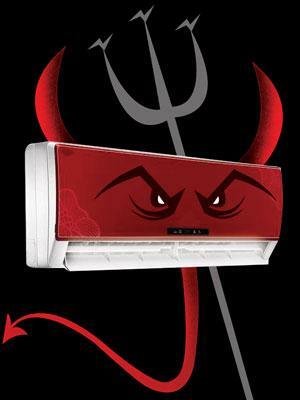 In this way, a five-star AC performed worse than a one-star AC when temperature was 45°C. Why does this happen? Quite simply because we have adopted test standards that do not suit our temperatures. The International Organization for Standardization has three different standards for testing the performance of ACs: mild, cold and hot weather conditions. India’s ISI standard has been derived from this, but by adopting mild weather conditions. This means ACs are rated for energy efficiency based on their performance in 35°C ambient temperature and 27°C inside. The same machine is also tested under maximum (46°C) conditions, but this is not to determine its energy efficiency. In this way, when you buy your AC, remember BEE/BIS, which sets the standard, has only certified that it will work with certain efficiency when the temperature outside is 35°C. This is when the National Building Code (NBC) data shows that out of the 60 cities surveyed, 41 cities, including Delhi, had temperatures over 35°C for 175 hours in a year—these are hours that determine peak loads. This is bound to increase, with heat islands growing in cities because of concrete and micro-climatic changes. Clearly, the testing method needs to be changed. But this is not all that determines the energy efficiency of ACs. In 2006, BEE started its energy standards and labelling programme. In 2010, energy-efficiency standards for ACs, set in terms of the energy-efficiency ratio, were made mandatory and the last revision was in 2014. What is shocking is that Indian AC standards remain way below global benchmarks. The specious argument is that we are a poor country, and so, I assume, we should continue to be swamped with outdated technologies by Indian and multinational companies. Last heard BEE was “revising” these standards upwards but the revision is delayed. So the AC energy-efficiency standard, which was to expire in 2016, is now notified by BEE to continue till 2018. Worse, when BEE “certifies” that an AC is star-rated, it does this based on the manufacturer’s self or third party efficiency report. Amazing trust! Amazing regulations! This is not all in the AC story. The usage of these machines has to do with us and our idea of comfort. According to NBC, thermal comfort lies in the temperature zone between 25°C and 30°C, with optimal conditions at 27.5°C. What is never told is what will happen to the energy efficiency of our machines and their operating cost if we crank down temperatures. CSE’s study found that running ACs at low temperatures of 20°C has huge energy penalties—2 per cent drop in the energy efficiency ratio for every degree temperature lowered below the 27.5°C optimal comfort level. In this way, the performance of a five-star AC becomes equal to that of a two- or three-star AC when we run it at 20°C, normal for most of us. This is also because comfort is determined, not just by what we set AC temperature at, but also by the amount of ventilation we have and, of course, the clothes we wear. If you work your air-conditioner with a conventional room fan your comfort goes up, simply because there is more breeze, hence more thermal comfort. But who designs modern buildings with ventilation? This is the age of sealed and centrally air-conditioned buildings. Fans are considered not-so-cool. In lifestyles we have been sold as modern, it is the wow factor that works and we over-cool our spaces and then wear climate-inappropriate clothes—suits and ties in summers. If we are really cool then let’s get AC maths and our clothes right. That is the real energy game-changer.